AVAILABLE IN A VARIETY OF CONFIGURATIONS FOR OPTIMIZATION OF SPECIFIC CP REQUIREMENTS. 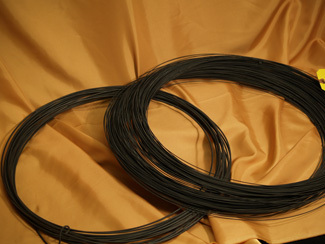 CerAnode’s anode wire consists of an ultra thin layer of iridium + tantalum + titanium, mixed metal oxide, deposited onto either solid titanium core (STI version), a copper cored titanium interface (CTC version) or a copper cored niobium-titanium interface (CNC version). Available in nominal standard diameter sizes of 1/16” (1.5mm) OR 1/8” (3mm). CerAnode CP anode wire is most often supplied in anode assembly configurations such as CerAnode’s Internal Potable Water Anodes, CerAnode’s Tank Anode for Water Storage Tanks, CerAnode’s Tank Bottom Anodes, CerAnode Linear Anodes, as well as for lock gates, intake screens, etc.